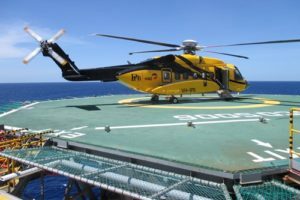 In February 2009, FlightSafety International made a move to the offshore helicopter training market in a big way. This is the opening date for the company’s 78,000-square-foot training center in Lafayette, La. Up and running are two Level D full flight motion simulators, both for Sikorsky helicopters—the S-92 and the S-76C+, convertible to the C++. Also installed and running are two Bell Helicopter Level 7 flight training devices (FTDs), one for the Bell 206 B3/L3 and one for the Bell 407. More on these later. The building is designed to accommodate eight full motion simulators and three FTDs for future expansion. The center manager, Amparo Calatayud, and the director of training, Dave Welch, hosted me on a recent tour through the facility. Trying to explain the highly technical and sophisticated equipment and their training methods to an old “has been” like me had to be a major chore! There are 25 staffers, 10 of whom are flight instructors and 10 who are maintenance technicians. The instructors work on a non-standard schedule and are available to accommodate the operators, regardless of clock time. The maintenance tech’s work a three-shift schedule so there is always someone there to keep the training devices and systems running. While near the simulator bay, I thought I was in a Star Wars movie. These machines are huge and watching them articulate through use of electric motion and control loading systems gives one an eerie feeling of being in a science fiction scenario. Ampy and Dave got right down to the business of training, giving explanations of the equipment and the training methodology that FlightSafety uses. Emphasis is placed on integrated training using a system developed by FlightSafety known as Matrix. A simplified picture of the Matrix system consists of four main components—full flight simulators, graphical flight deck simulators, desk top trainers used in the classrooms, and the SimVu debriefing system—an amazing innovation for the training environment. Developed by FlightSafety, SimVu consists of a two-station (pilot and co-pilot) arrangement where information is presented using a series of flat panel touchscreens. A computer-generated reproduction of the simulator flight the two students completed is brought up on the multi-screened display. The instructor uses the system to review the simulator session and to reinforce training lessons with the student’s active participation. The classrooms are state-of-the-art, and every student has a touch screen in front of him or her. The instructor can manipulate all the screens from one station, and the students have a limited amount of freedom to input scenarios that will be placed on the huge master screen facing the classroom. You’ve never seen a blackboard like this. There is color and movement. Name any aircraft system, such as hydraulics or electrical, and it will pop up in just about any detail you want. This is real-time systems training. You see what happens in the cockpit and with the aid of a split screen, you instantly observe what is happening to the systems within the aircraft. So, the lessons learned in the FFS, the graphical flight deck sim, desk top trainer and SimVu all reinforce each other. It’s such a complete training system that it can be likened to a new language immersion program. They don’t teach the test, they teach you how to function as a complete CRM team, fully qualified in the aircraft and full of confidence in yourself and the aircraft. The two Bell FTDs are the latest in technology and are the only Level 7 trainers that FAA has certified. They are not motion equipped but do have vibration and of course, audio. When sitting in the cockpit, a 220-degree concave screen surrounds the user. The graphics that are displayed are computer generated but are very close to real-world views. 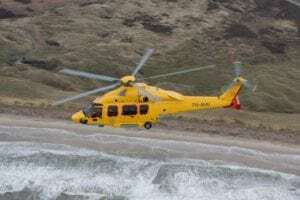 There is a wide variety of scenery that can be generated, everything from airports, helidecks, and medevac accident scenes. Most scenes can be tailored to the customers flight operations. The visual system uses three hard drives, each with multiple terabyte capability to make the projections. Something this big and sophisticated needs a lot of power. 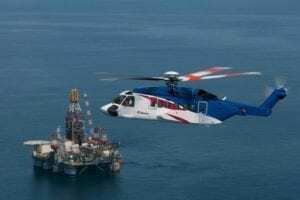 Centered in the heart of the offshore helicopter world, FlightSafety has become an integral part of flying safety, not only to the Gulf Coast operators but to a number of other aviation segments as well. 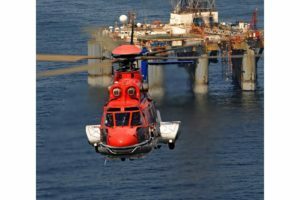 The training can be customized to meet the specific needs of government and military agencies, as well as business and commercial helicopter operators, including EMS, law enforcement, SAR, airborne surveillance, security and firefighting. As a final note, FlightSafety’s Lafayette operation is not confined to North American helicopter companies. They have students from Malaysia, Brazil, West Africa and Japan who use the facility on a regular basis.